Google Analytics is a one-stop-shop where you get an overview of your visitors’ behaviour when they’re interacting with your brand online. Since it’s the biggest search engine in the world, it should come as no surprise that measuring and tracking your presence within Google is imperative. With our Google Analytics dashboards, it’s easy to assemble all your data together in one place… whether it’s from Google, or any other data source you use! Create your Google Analytics dashboards today! 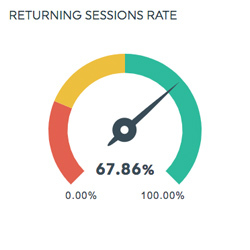 This gauge widget shows the percentage of sessions derived from visitors who have already visited your site at least once before. It is calculated by dividing the number of sessions from returning visitors by the total number of sessions. 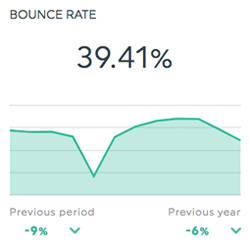 This historic widget shows the percentage of visitors that landed on your site but left immediately after arriving without browsing. It is calculated by dividing the number of sessions viewing only one page by the total sessions on your site. This list widget shows the landing pages through which visitors arrive on your site. 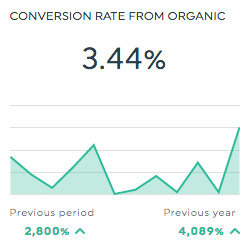 This historic widget shows the number of conversions that can be attributed to organic traffic. Want to see all our Google Analytics preset widgets? This shows the total number of pages viewed. Repeated views of a single page are counted. This shows the average revenue per session. For mobile apps, this is the average for in-app revenue only. Acquisition revenue (like from app purchases within a marketplace like Google Play) is not included. This shows the number of single-page visits. This shows the sum of all individual goal conversion rates. This shows the average cost of each transaction. This shows the percentage of page impressions that resulted in a click on an AdSense ad. This shows the length of a session in seconds. A session lasts as long as there is continued activity. This shows the average number of pages viewed during a session. Repeated views of a single page are counted. This dimension allows you to isolate your data based on your users’ age bracket. This dimension allows you to isolate your data based on the language settings in your users’ browsers. Analytics uses the following ISO codes, For example: en (English), en-us (English, United States), en-gb (English, Great Britain). Want to see all our Google Analytics metrics, segments, & dimensions? What do I need to know about Google Analytics filters and segments? How do I create a master Google Analytics dashboard with all my clients’ accounts? Time-saving features in Google Analytics you may not know!